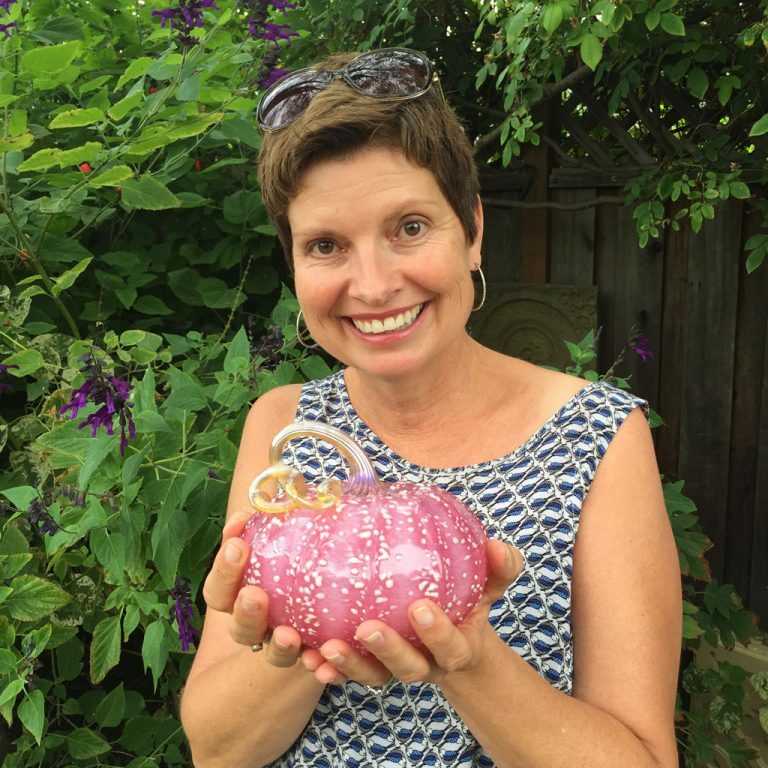 It’s taken me several days to write this, as I just can’t seem to grasp that a year has already passed since I posted my glass pumpkin photo with the accompanying news of my cancer diagnosis. Some days it feels like it was a lifetime ago, while other days it feels like only moments have passed. Yet here I am, unwrapping my treasured pumpkins. And just as I had predicted, I’m filled with an overwhelming sense of joy and relief that I made it through that frightening, dark tunnel. I owe so much of my safe passage to many of you who have sent encouraging and hopeful thoughts along the way. To say that your words have meant the world to me doesn’t do them justice. So please know that I have cherished all that you’ve given me, be it a ‘like’ on a Facebook post, a heartfelt email sent to me in private, loving bear-hugs when I’ve seen you in person, sweet little gifts left on my front doorstep and everything in-between. I am blessed to have you all in my life. I haven’t been writing as regularly as I’ve wanted to due to chemo-related fatigue that could fell a giant. The bald head, the nausea, the surgeries – those side effects I anticipated. The fatigue? Not so much. It’s only been during the past few weeks that I’ve finally felt like my old self again. Hallelujah! And just in time, too, as I’ll be picking up my public speaking again (thanks to so many garden clubs who graciously re-scheduled my earlier commitments until this fall.) In hopes that I might see some of you in person, here’s where I’ll be during the next few weeks: San Diego Horticultural Society (next week! 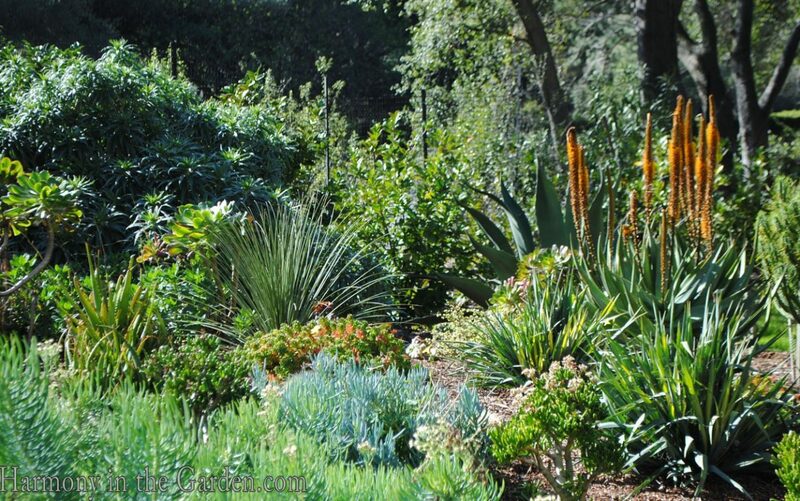 ), Northwest Perennial Alliance (September 20), Palo Alto Garden Club (October 6th), and the Diablo Women’s Garden Club (October 7th). One of the things that has brought me so much joy during this difficult year was receiving regular updates from past clients regarding the progress of their gardens. Instead of the more common ‘’why is my plant is dying’ questions, I’d receive dozens of ‘look at my beautiful garden’ photos. I appreciated these emails so much that I thought I’d share some of these gardens with you today. 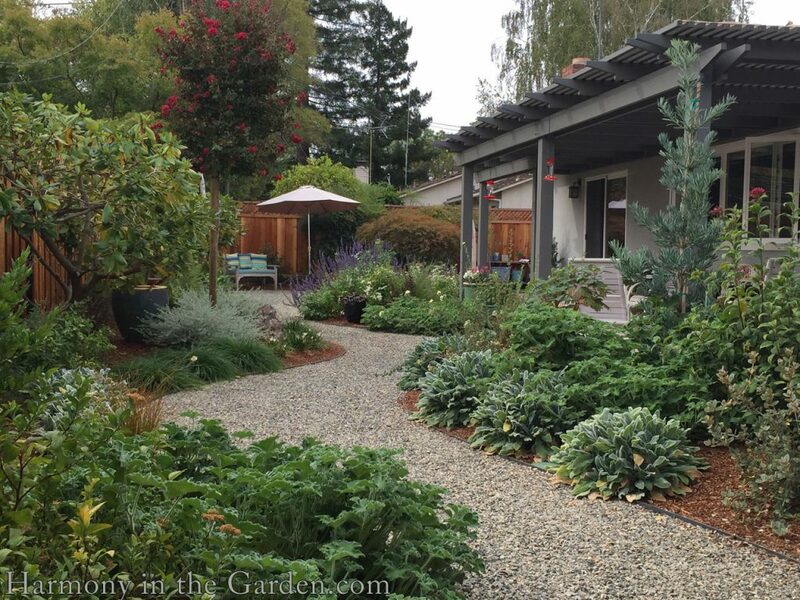 The two things these gardens have in common is that they’re all relatively new (1 to 2 years old) and they all involve replacing large expanses of lawn with tough, beautiful and low-water plants. 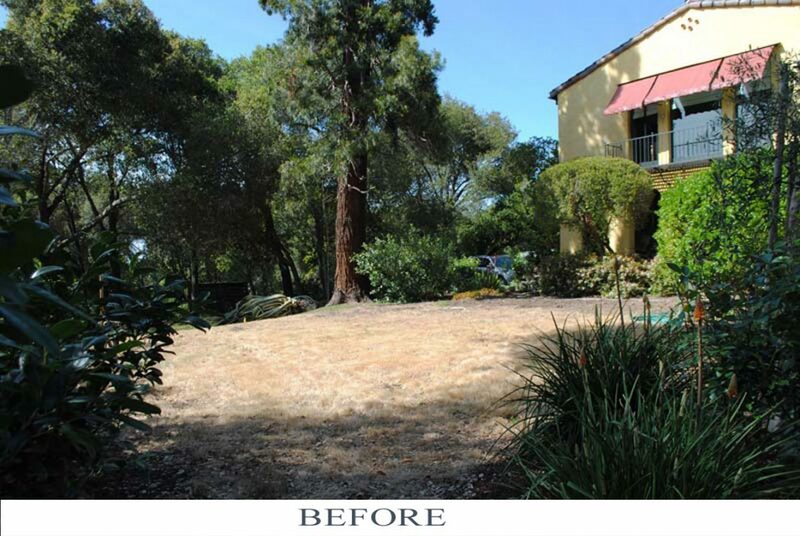 In some cases we removed the entire lawn, in other cases only part of it. 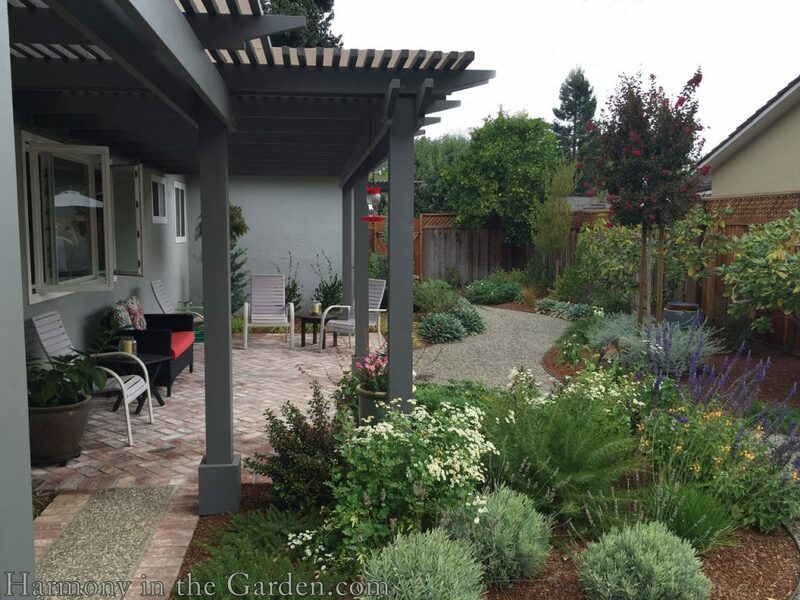 These gardens are now brimming with color, texture, form, life and happy homeowners (while using much less water, too!) I hope you enjoy the tour. Two years ago we replaced an entire rear lawn with two connecting bluestone patios. 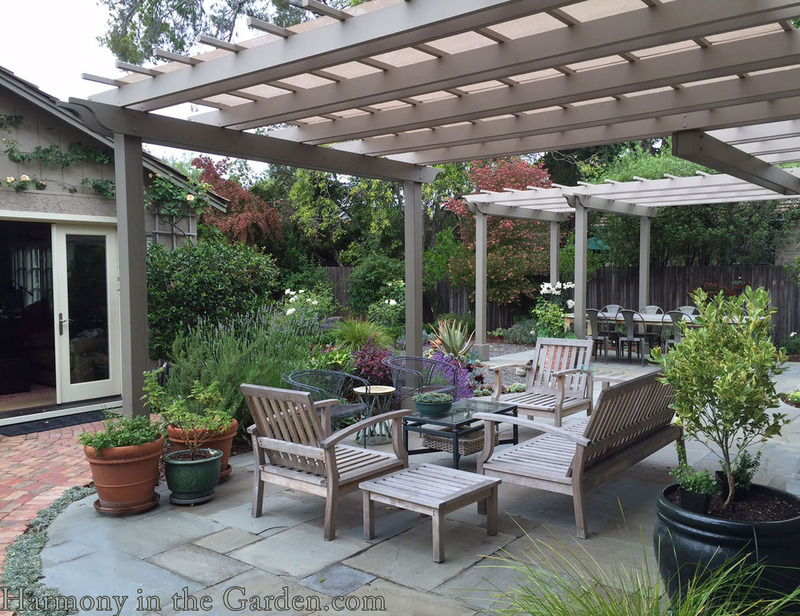 Each patio is covered with a slightly different arbor: one that’s open to let in the warmth from the sun (for my always-cold client) and the other with shade-providing screening. 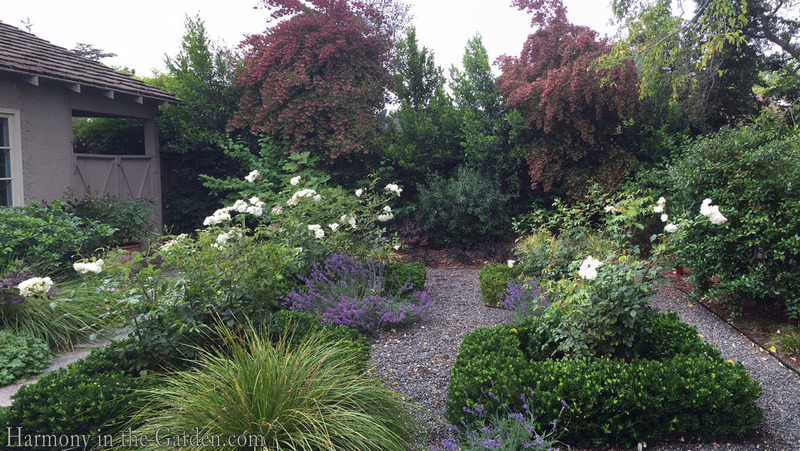 Using my clients’ many trips to Europe as inspiration, we created a parterre garden containing four symmetrical beds with gravel pathways meandering throughout. 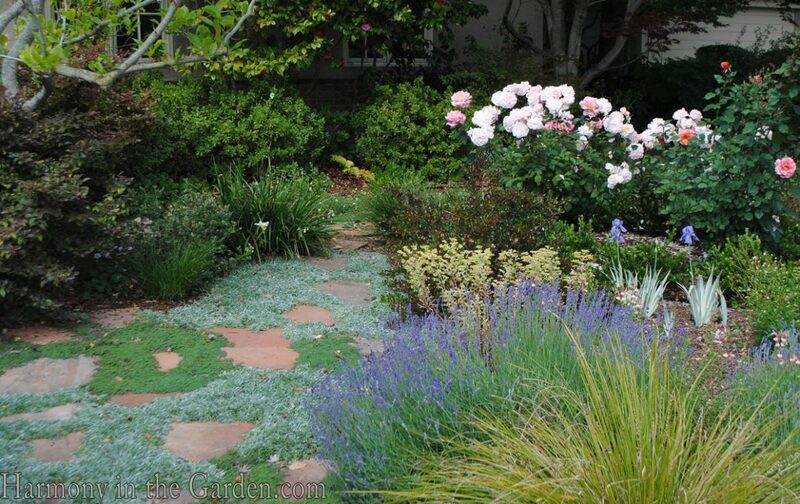 Each bed is bordered with boxleaf euonymus and filled with traditional ‘Iceberg’ roses, lavender and carex grasses. 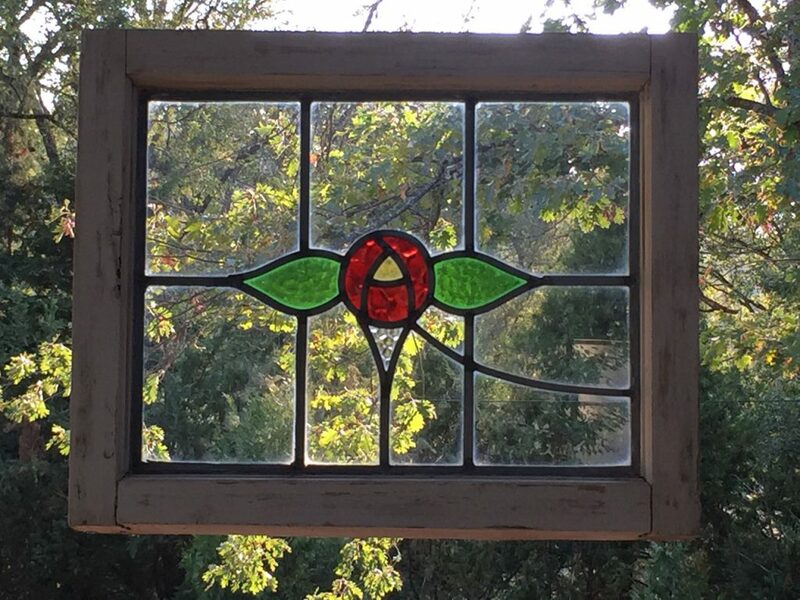 Now, the only thing left is to find the perfect antique olive jar to place in the center of the four quadrants and the garden will be complete! I love the regular emails that I get from these clients as they’re always filled with delightful surprises. The latest example happened earlier this week when I received this: “My seven year old neighbor likes to sit in the maple tree, next to our back fence, and where they have a zip-line strung across the yard. So, she had a friend over and I could hear them talking when I heard the little boy exclaim: “Whoa, that’s a cool yard!” she replied “I know, and it’s just for two people”. Should I feel guilty having such a cool yard, for just the two of us? Last week, I met with these clients and was informed that they compared this month’s water bill to last year’s and it’s 60% less. 60% less, people!! That’s a lot of water saved from replacing a boring, unused lawn with plants that now attract dozens of hummingbirds, butterflies and all sorts of life. I’ve been working on this stunning property for the past few years and am thrilled to see the progress of the succulent garden. 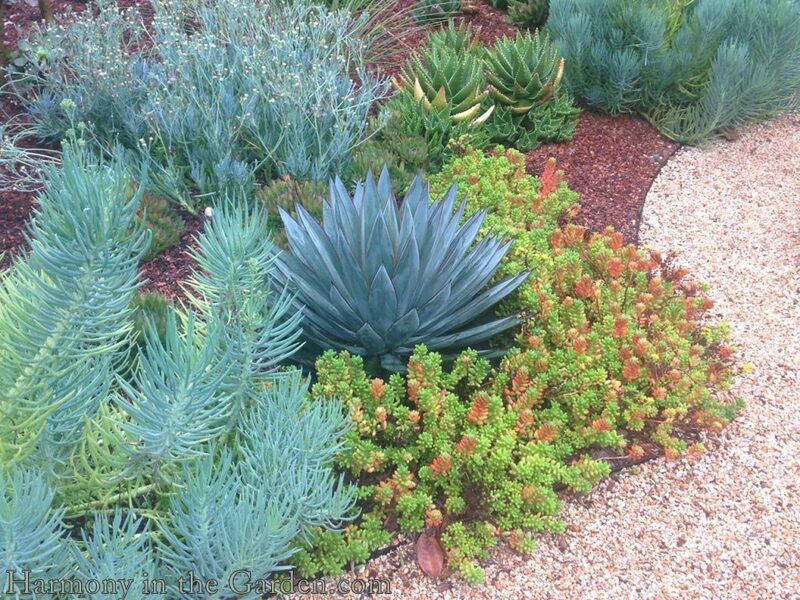 Once a barren patch of dead lawn, it’s now filled with colorful, tough and non-thirsty succulents. 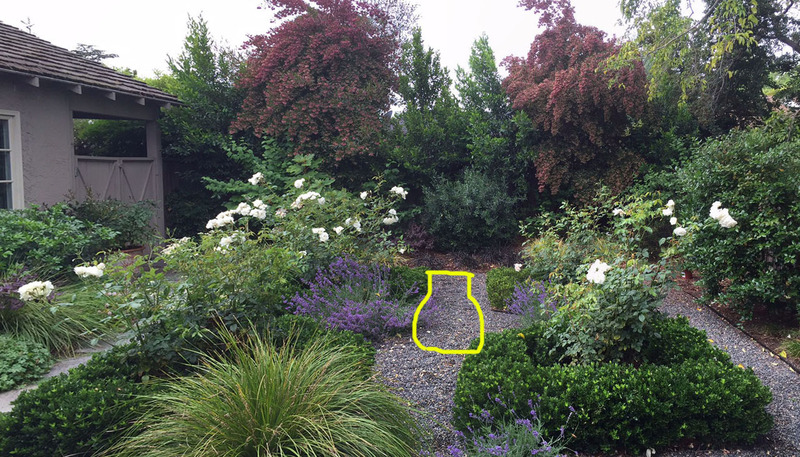 We designed the keyhole-ish shaped gravel pathway to softly circle an impressive antique olive jar-turned fountain (thanks to Eye of the Day), which is the star of this corner of the garden. I’m so glad to hear you’re on the mend and feeling more like your old self. It was so nice to see you at NPA this afternoon. Loved Loved your presentation. The book is what I needed to help rearrange a section of my garden. Your next visit will also have to be with my Garden Clubs. Nice to see the before and after photos; places I would be comfortable in. Great job. You’ll get past the cancer because you’re a strong woman and you don’t dwell on the that-ifs or whys. I’ve had cancer and it’s way in the past and most of the time I don’t think about it. I’m glad you liked the photos, Elrieda, and happy to hear cancer is in your distant past. Looking forward to the time when I can say them same thing – soon! Cheers for you on making it through such a difficult year! So glad to hear you’re feeling well enough to take on more of your normal routine. 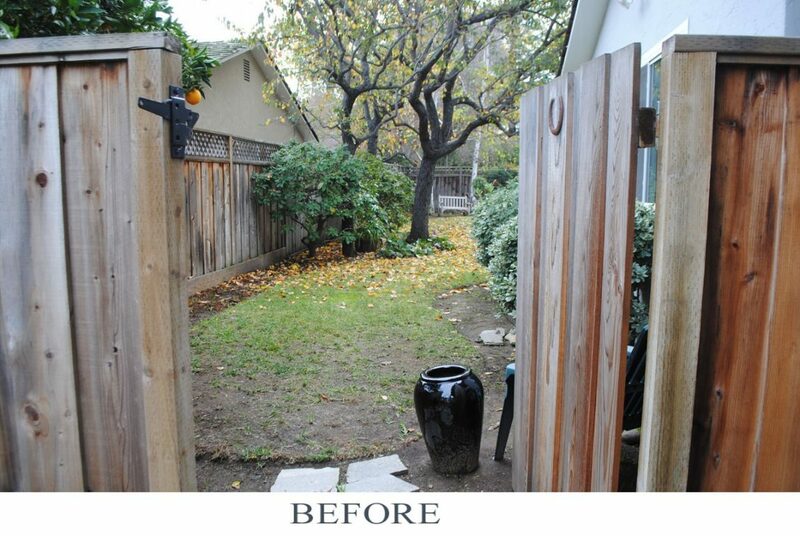 The before and after photos are so fun – what marvelous changes you have made in those yards. Absolutely beautiful! Thank you, VW, both for the good wishes and for the compliments on these gardens. They were (and continue to be) so fun! Your inspirational post came at an important time for me. I received a diagnosis just this week of a rare endometrial cancer and am facing surgery and chemo. I’m looking to family and my beloved garden to give me comfort and courage. I’m looking forward to future posts. Oh, Nancy – I’m so sorry. Every cancer, every treatment plan, and every body is different but regardless of that, I know you’re in for a challenging time ahead. Please remember that even though things seem to be spinning wildly out of control right now, there WILL be an end to this – you just need to get through it right now. And I’m glad that you have your family and garden to lean on for courage and comfort. I can’t imagine going through something like this without them. Please take care of yourself and I’m sending you lots of positive and healing thoughts. Rebecca, The gardens are beautiful, thank you for sharing your wonderful work. I especially love the succulents and wish that more would overwinter in the Chicago area. I am thankful that you are feeling back to normal and that soon this past year will only be a memory! Such beautiful transformations in the gardens, especially as only the weeds are green in our lawn. 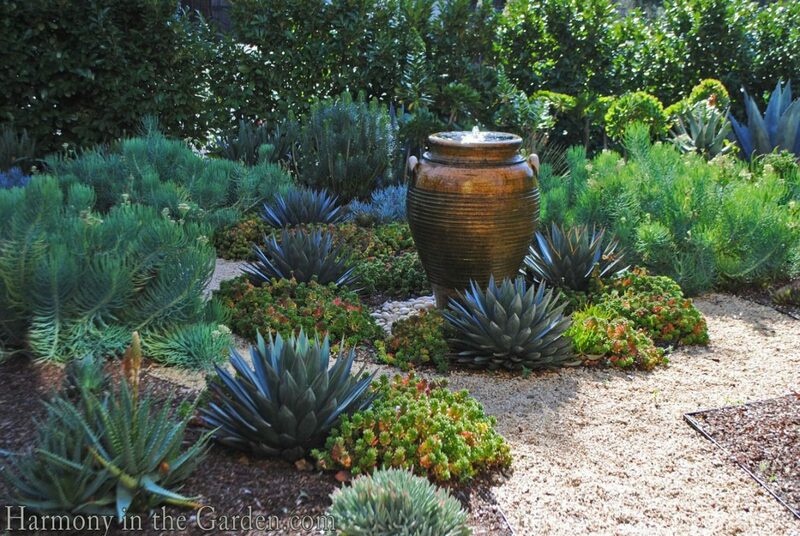 What area is the succulent garden located ? Your gardens, writings, and recovery are an inspiration, so glad your energy is coming back! Hi Susan, and thank you. 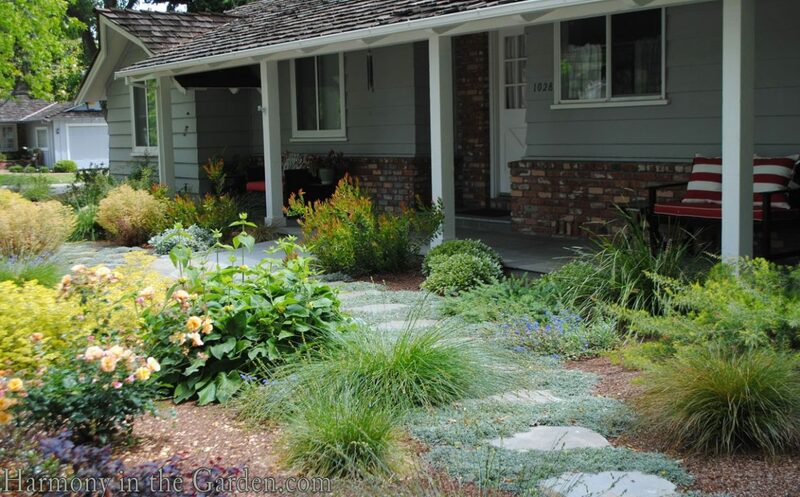 I’m glad you like the gardens (and your lawn sounds like mine – green, thanks to the oxalis!) 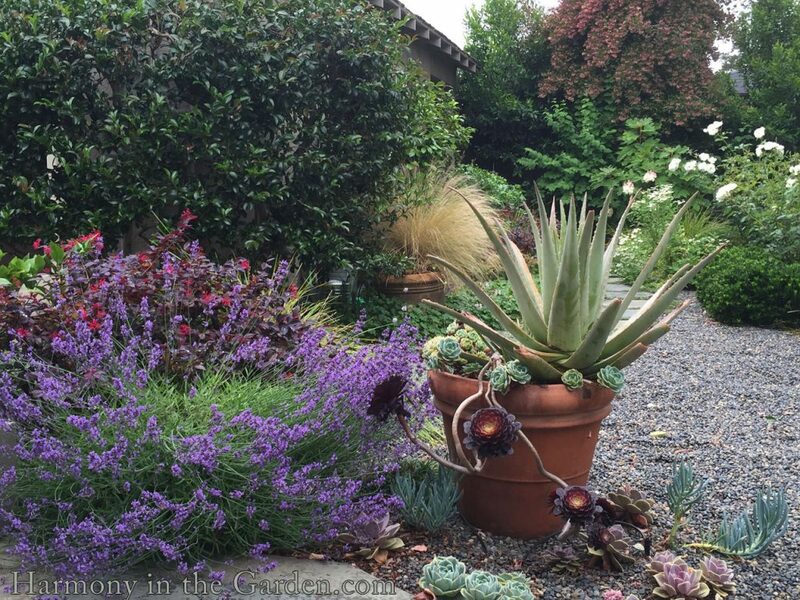 The succulent garden is located in Palo Alto, zone 9B, so they overwinter here with few problems (knock on wood). So glad to read that you are feeling like yourself again. I do not know you other than following your blog & thru FB but you have such a courageous heart & soul. I can only imagine how scary the journey was. Stay strong. You are an inspiration as a person & garden designer. I LOVE the before & afters. They are making me want to re-do my backyard. Wish you lived in Colorado! I would hire you. All the best!!! Thank you, Kathleen – I appreciate your kind words and compliments. Thank you, Susie – I so appreciate your kind words! I so enjoyed reading your latest news! I am in Ireland and actually have a question about your presentation for DWGC on Oct 7–just got a message from club president asking about your set-up for our meeting–do you use a PC or MAC for your slide show? I have been seeing some amazing gardens here–yesterday was Helen Dillon’s here in Dublin and today we are off to Powerscourt. Again, so glad to read about your recovery. Hi Rebecca – so nice to hear from you and your fabulous trip to Ireland! I’ll bring my Mac (I also sent you an email this morning…) Take care and I’ll see you soon! Thrilled to hear that you are better! Thank God! Those gardens are exquisite, but nothing compared to you. (No bias from this cousin.) I love looking at your photos and could not possibly be more proud. So wonderful to read a new blog post from you and know you’re finding your energy again. Sadly too far to travel from Sydney Australia to hear you speak in person, but your design work and thoughts about it are always an inspiration. Many of the dry tropics plants you use thrive here in eastern Australia too and the way you combine them always seems to have such a pleasing rhythm about it. Nice to here from you, Catherine, and hope you’re doing well! As you know, Australian plants are some of my favorites and can’t imagine designing a garden here without them. Thank you for your compliments – I appreciate them! So glad to see your blog resume. You look gorgeous! Just wanted to give you a big virtual hug and let you know we still have a barren rear yard after our construction and when you are ready to get back to larger projects, I would still be honored to have you do ours. Thank you, Jeanine – so nice to hear from you! Maybe we can talk soon – I’m not able to take any more clients this year but have openings starting in February. Not sure if that works for you or not, but if so let’s talk! Hi Rebecca, I am a friend of Sharon Lovejoy’s. Because of her, I joined your blog a year ago, just as your cancer journey was beginning. You grabbed my heart because my sister had just completed a similar journey. She is now full of energy and happily back at work. I’m so glad you are also! 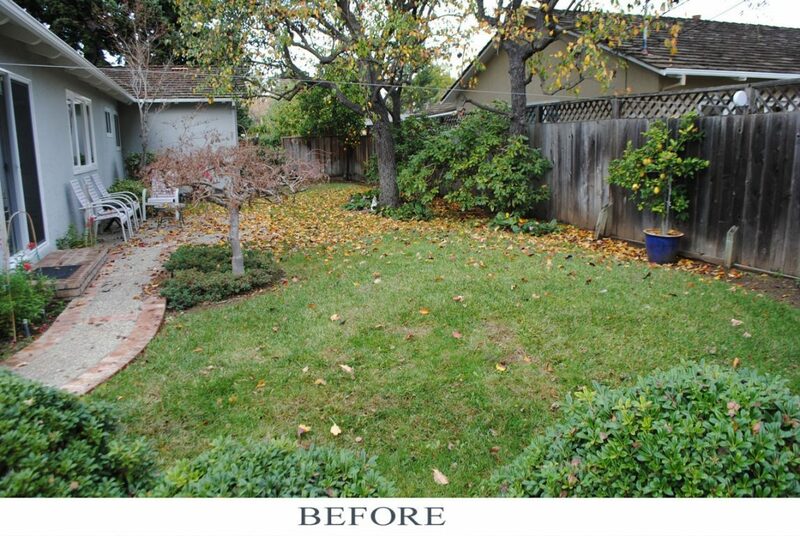 I love your gardens, especially the before and after pictures. 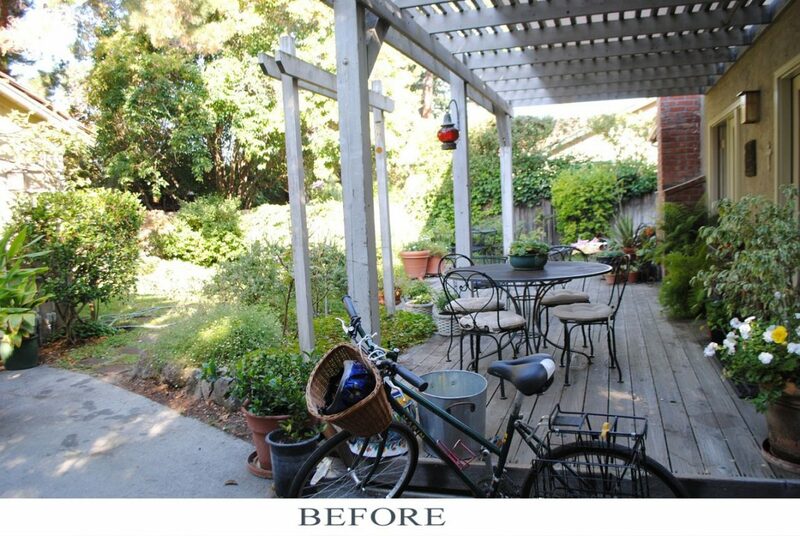 What beautiful transformations, from ugly to Oh-I want-to-be-sitting-there- enjoying! I’d love to see one someday. Great to hear your voice again! And you got your mojo and smile intact. Yippee. I reference you all the time and your books are well shared. Your journey adds another layer to your gifts. Hi Dot! Well, I’ll admit I’m still trying to get my mojo back but it’s getting there. 😉 I’m so happy you share and appreciate my books – makes me smile. I hope all is well in your life and hope our paths cross again soon! So happy to see your post today, and to hear that you’re finally feeling more like your old self. I’m redoing an area in my back garden with drought-tolerant plants, but it’s going to be tricky. It gets quite a bit of shade in early spring, but in high summer, gets morning shade and hot afternoon sun for 6 hours. 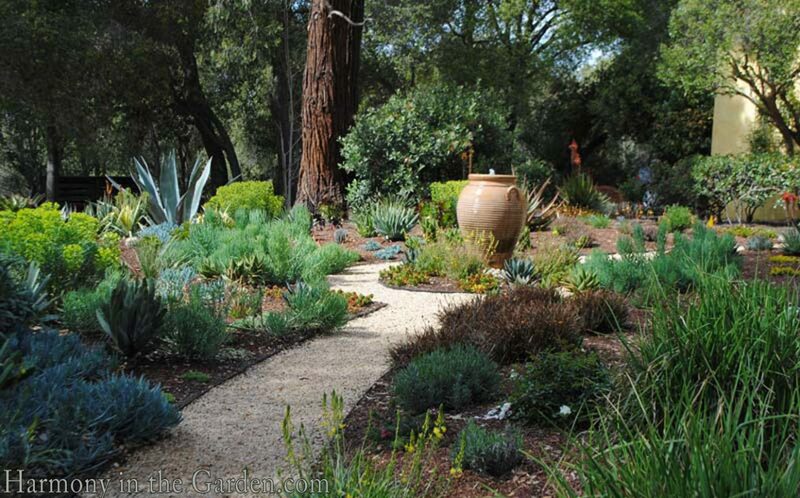 So many drought-tolerant plants like full sun. Well, we’ll see. Hope your talk for the NPA goes well! Thanks Alison – I appreciate your good wishes. You definitely have a tricky area you’re dealing with. Have you taken a look at Flowers by the Sea’s website? They have a great site where you can type in your garden’s conditions and they’ll tell you which salvias will thrive there (and there’s several which can take the shade and are low-water). Euonymus are a good filler, too, for those in between zones (though definitely not super exciting). Annie’s Annuals has a good site, too, and they can help you find something that might be exactly what you’re looking for.. So glad to see your post today Rebecca. I can’t tell you how much I enjoy looking at your garden photos. You have a very unique style that I haven’t seen anywhere. I absolutely love the way you use plants and walkways and pottery. So happy to see you are back and feeling better. Thank you, Diane – what a fantastic compliment! You’ve made my afternoon! I hope to see you at the Diablo club, too – I think they’re pretty accommodating with guests as I recall. Such good news to hear that your energy is returning. And, I think your hair is adorable! The gardens are lovely and in this drought, amazing. The world is lucky that you are on the comeback trail. Now, don’t exhaust yourself, pretty lady. Thank you, Jo, I appreciate it! I’ll take care of myself, I promise. 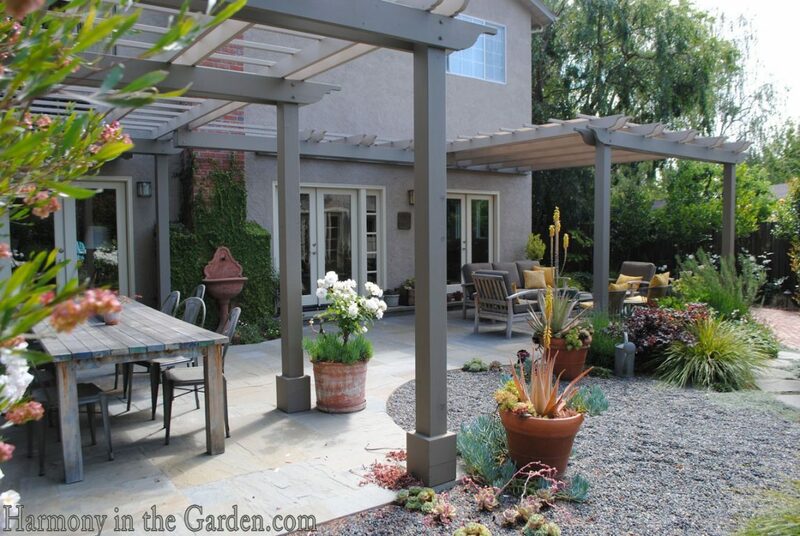 Hope your garden is hanging in there with this horrible heat and drought! Oh, I just ordered a ‘Polka’ rose for my own garden – your photo inspired me! Thanks for sharing your journey with us. It really helps shed some light on what loved ones were going through. Sometimes I think they try so hard to reassure family that everything is going to be OK, they avoid sharing their day-to-day struggles. We continue to Relay For Life annually here in WI in honor of and memory of family members and friends who have fought the battle in hopes of that elusive cure. So glad to hear you are among the survivors and willing to share your inspirational journey. 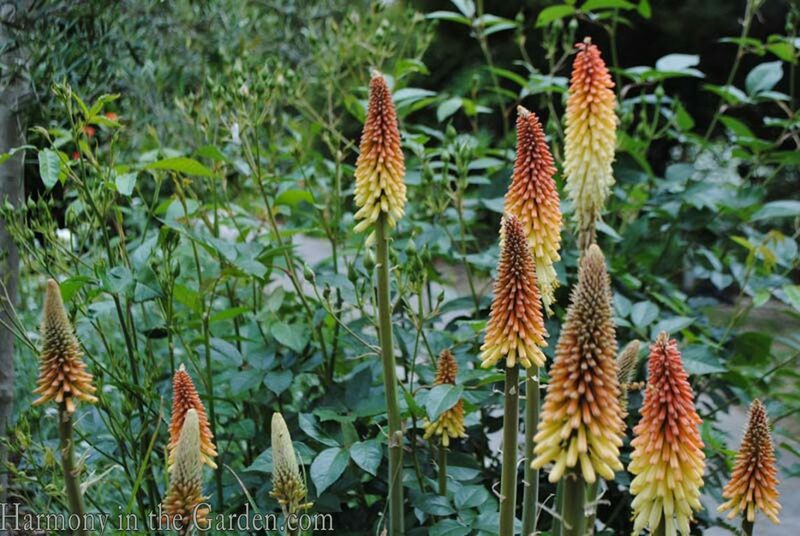 What beautiful gardens-each with it’s own unique character. I am especially fond of that last garden filling in with colortful suculents! Thank you, Sue – I really appreciate your sentiments and count my lucky stars on a daily basis. Such beautiful gardens. And, inspiring. So glad that you’re doing so much better. Going through something similar…but, not as intense…I understand the debilitating fatigue. It’s so frustrating. You’re looking great. And, I love your pumpkins. I think about you often, my friend, and missed you at P. Allen Smith’s this past spring. I hope our paths cross once again. Sometime, somewhere. Thank you so much, Donna – yes, now that I’m on the other side it’s certainly a great place to be. I never want to go back! Rebecca, first, yaaaay for getting through that awful year! I am so happy to hear you are feeling better, with more energy, and I also think you look adorable with your short ‘do. Second, these gardens are STUNNING. 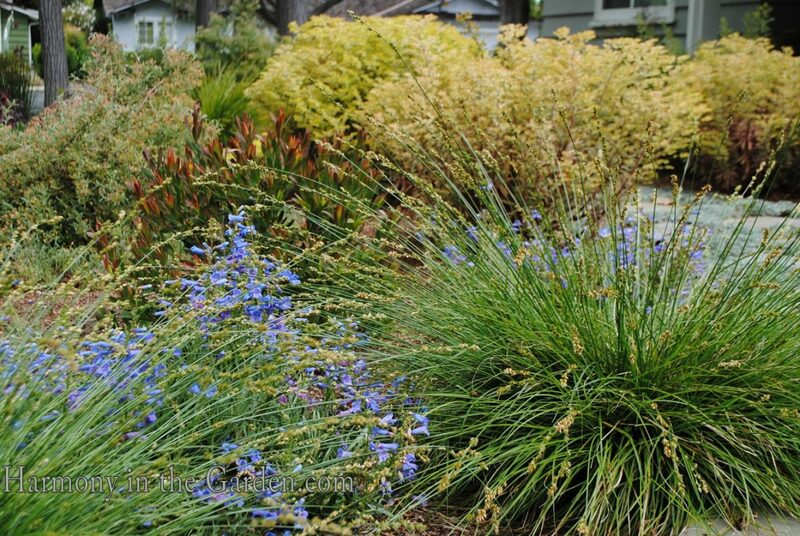 Great examples of gardens that don’t sacrifice beauty for water thriftiness. Thanks so much for sharing them with us. Thanks, Pam! It’s been hard for me to accept my hair (I feel like I look like a little boy – ha!) but hey – that’s small potatoes, right? I’m glad you enjoyed these gardens. It’s been incredible to work with these amazing clients and share in their joy as they see their gardens grow and fill in. Fills my heart, that’s for sure. 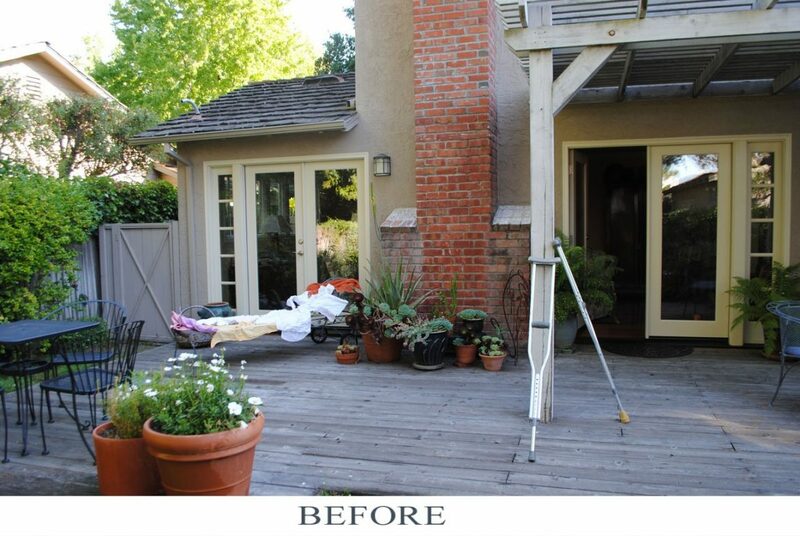 Before and After pictures are stunning! What a difference!It’s difficult to believe these are the same gardens. It’s so nice to read and to see you again! Thanks, Tatyana – I’m so glad you enjoyed them. I always like to take lots of ‘before’ pics as it’s so amazing to see a garden’s transformation. So glad for the update – I was just thinking about you! I’m glad you are up to fulfilling your speaking engagements. The gardens are beautiful. Thank you, Barbara, I appreciate it! Thank you, Dee, I’m glad to be back!